Connemara Therapeutic Riding (CTR) and Connemara ponies will attend the upcoming HETI Congress in the RDS running from 25th – 29th June. Connemara pony Loch an Éala pictured at the Coral Strand, Ballyconneely,Co. Galway with (l to r) Jacqueline Boulger (CTR Coach), Grace Herbert, (CTR client), Pearl Brow (CTR volunteer) and Noé McLoughlin (CTR client). Connemara Therapeutic Riding (CTR) established a permanent Therapeutic Riding Service in 2015. CTR has witnessed firsthand the huge impact Therapeutic Riding has had on a number of families in the Connemara region. 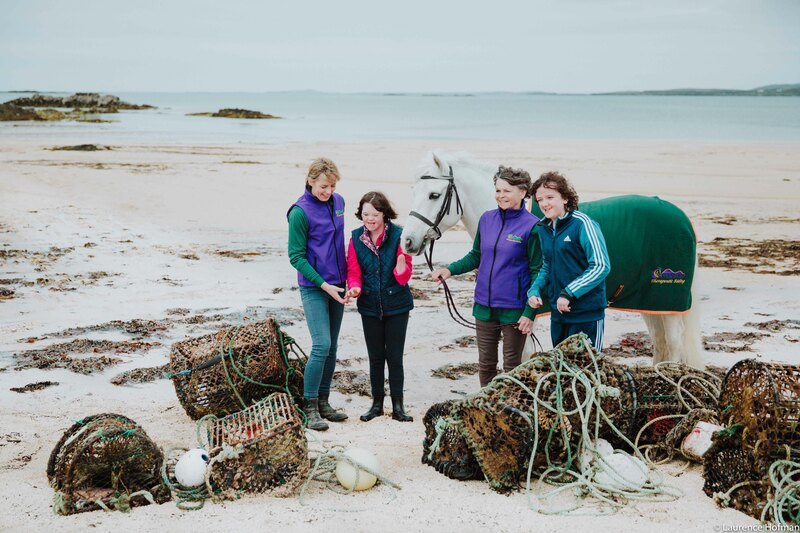 It aims to provide a community-based Therapeutic Riding (TR) Service for children and adults with physical, sensory and intellectual disabilities in a remote rural setting in the west of Ireland while promoting the indigenous Connemara Pony as an ideal equine for this therapy. Currently forty clients are availing of the service including a number of children who attend as part of the curriculum in the Autism (ASD) class in local schools. TR sessions take place at Errislannan Manor on the Errislannan Peninsula, which is located outside Clifden, Co. Galway. The setting is probably one of the most picturesque and peaceful locations in Ireland. Sheltered by a surrounding wood the Manor overlooks a trout lake and is bounded by Connemara’s moors and mountains, lending itself to natural sensory trails and a stress free environment. This year Ireland is set to host the 16th HETI Congress of Equine Facilitated Programmes in the RDS from June 25th – 29th. CTR is honoured to have been invited to partake in the opening ceremony with Connemara Ponies on the 26th June. Connemara ponies have proven to be the ultimate therapy pony with their gentle disposition, sturdy conformation and sure footedness and CTR looks forward to demonstrating to a worldwide audience the suitability of Ireland’s native pony as the perfect TR pony. Two Connemara ponies, a group of TR coaches and a number of volunteers will travel from Connemara to the RDS to attend the HET congress. CTR is grateful to receive continuous support from the Connemara Pony Breeders’ Society, Horse Sport Ireland and the Connemara Pony Sales, Clifden, all of whom recognise the important role the Connemara pony plays in TR. Noel Brett, President of the CPBS says “We are delighted to see the Connemara pony being marketed as the ideal equine for Therapeutic Riding, which really shows the versatility of this fantastic breed. The CPBS is proud to play a part in supporting CTR’s attendance at HETI”. 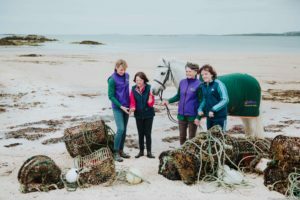 Loretta O’Malley, Chairperson of CTR feels HETI is “an important opportunity for CTR to communicate the benefits of TR and the work being done by this largely voluntary organisation, while promoting the Connemara region and the indigenous Connemara pony”. Visitors to Connemara are welcome to come along and experience a TR session. For more information on Connemara Therapeutic Riding please visit www.connemaratherapueticriding.com or like Connemara Therapeutic Riding on Facebook. Therapeutic Riding is an equine assisted activity which can be effective in improving balance, co-ordination, emotional control, self-confidence and self-esteem. It provides an intense, multi-sensory experience. It can help develop muscle tone and improve posture, support the development of fine and gross motor skills, help promote efficient sensory processing and aid with social skills.